Park City Amy and Amy Lou Who are hosting their second Sew and Tell--head on over and add yours if you have something to show off! The pattern is from Ottobre Design 1/2007, size 74. 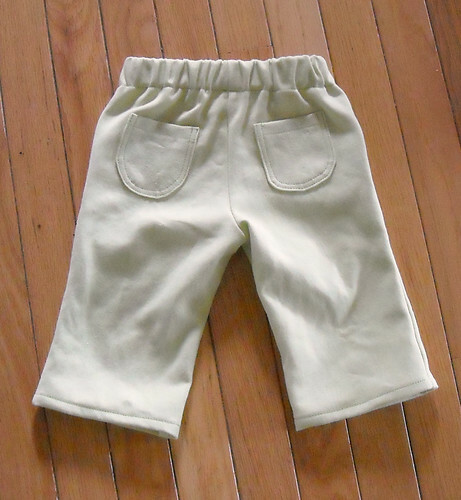 They fit really well with some growing room (she is maybe just under 16 lbs now and 12 month size store bought pants are still a bit too long). I love those front pockets; they crack me up. I finished the dress a little while back but hadn't shown it yet. Once she's up and walking I figure she can wear it as a top in the winter too--layered over long sleeves, maybe. And, she is getting close. We were in the bookstore tonight and Cory was showing L a stuffed dog. She stood up and was actually able to stay balanced for more than just a second. 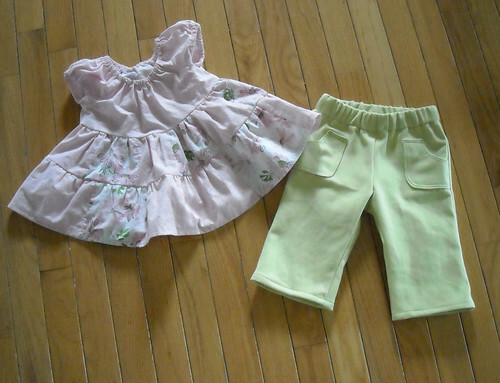 Oh yeah, and these are made from some of my Target tablecloth stash fabric. I love finding fabric at Target, and bought this table cloth and a similar pink one a couple years ago. If you're interested in seeing what some folks have been doing with 9-patches, go here. I am just working on mine when I want to, and I am not quite sure what I will end up making with them (I am thinking, maybe queen size?) I am hoping to swap some with a few friends so let me know if you're interested in doing that. I also made four cloth napkins from Katie jump rope fabric today, and two blocks for my Christmas quilt. It was a fun day. I love your Grandpa's quilt. It's always means so much to have a signature quilt. I'm sure he will love it. 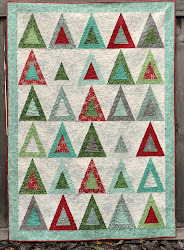 love the quilt for your grandpa, such a great idea!! The dress and pants are super cute. What pattern did you use for the dress?? what a great version of yellow brick road.. and for such a great occasion! 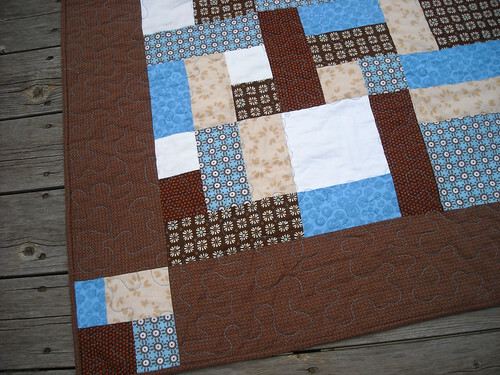 That quilt is beautiful and the light blue thread sets it off just right. Those pants you made are too cute. Great stuff, Vic! I never would have thought of using a table cloth for clothes. I'll have a whole new outlook at Target now. I love that quilt for your grandpa, he is going to love it. The colors and pattern escpecially draw me! 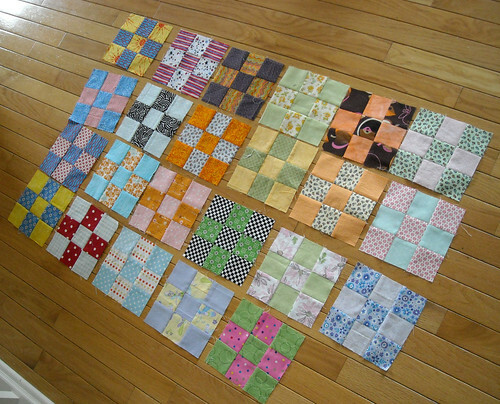 You have been busy, and I love the quilts you have been working on. Especially L's quilt, it looks great! Do you want me to send you a picture of the quilt all signed from the party? Your grandpa's quilt is lovely. The colors are so yummy. I'm sure he'll be tickled! 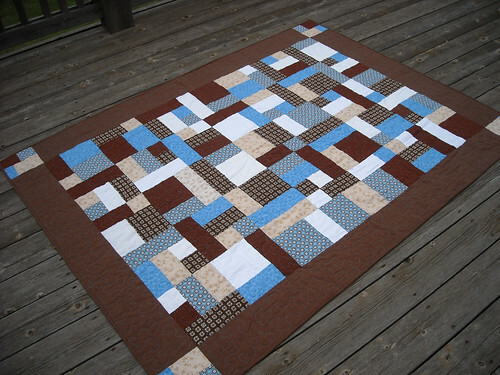 What a great idea for your grandpa's quilt! Having the signatures will be so meaningful!